While Mobile Memory Mouse 8000 has some odd flaws, it's a fundamentally well-designed mouse that would make an excellent addition to your road warrior arsenal. 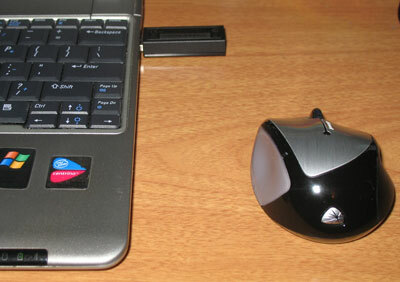 The design of the Mobile Memory Mouse 8000 is futuristic simplicity. Small enough to fit comfortably in the palm of the hand, the mouse’s chrome and black plastic exterior makes it look like a sports car prototype; something Honda or Toyota would produce to model a car that runs on converted water vapor but can still hit a top speed of 120 mph. The ergonomic grips and frictionless feet promise a comfortable working experience, while the simple arrangement of mouse and wireless receiver underscore the Mobile Memory Mouse 8000’s use of technology to simplify the working experience with fewer wires and easy portability. If your computer has Bluetooth, you can even skip the receiver and connect directly with Bluetooth with the flick of a switch. 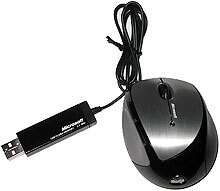 My favorite part of the Mobile Memory Mouse 8000, however, is the charging wire, which uses magnets to connect to both the mouse and the wireless receiver to charge the mouse’s NiMH rechargeable battery. The wire, which fits snugly along with the mouse and the receiver into the included soft carrying case, doesn’t just connect to the charging points: it clicks into them. If you’re like me and enjoy playing with magnets, you may find yourself connecting the charging wire during idle moments just to hear the satisfying click. 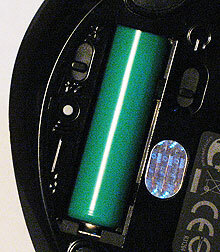 The battery itself is a nickel-metal hydride (NiMH) AAA rechargeable battery that comes with the mouse. Charging is fairly quick; getting a day’s charge requires 15 minutes connection to a computer through the charging wire, while a full charge requires 5 hours of connection time. According to Microsoft (warning: PDF), a full charge should give three weeks of battery life. If for some reason you don’t have a chance to charge the battery in that time – or you forget – you won’t be able to use the mouse until you either plug the mouse into the receiver, or switch in another AAA battery. Running the mouse without a battery at all sets off the low battery LED on the mouse, but otherwise generates no response. 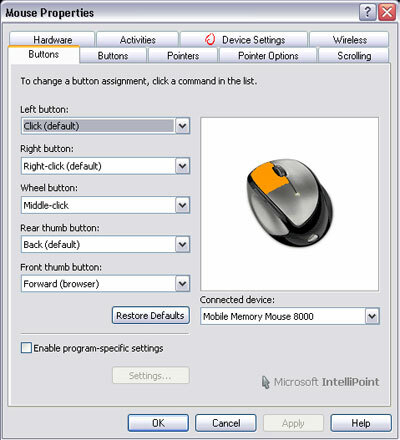 IntelliPoint, Microsoft’s mouse control software, gives you access to all of the settings you’ll need to program the Mobile Memory Mouse’s five buttons. 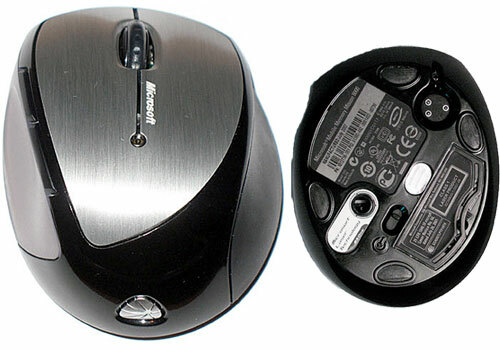 The software, which integrates into the existing Windows Mouse control panel applet, divided tasks up into a series of tabs, and includes general level control, including settings for things like scrolling speed, laser sensor sensitivity, double click speed, and button programming at the top level. If you’ve used the Windows Mouse control panel before, the layout should be familiar, and many of the configuration options will be where you expect them. The IntelliPoint control panel interface should be familiar to anyone who’s used the Windows Mouse Control Panel before. IntelliPoint allows you to set program-specific settings in the Buttons tab via a pop-up dialog window. The new window allows you to select individual programs using Windows Explorer, then select from a list of about 25 options to program each button. Included on the list is an option for launching macros and an option for programming in individual keys or key combinations. You can disable all program-specific settings at the top level with a checkbox, and re-enable them later on with losing any of your saved settings. Selecting a macro launches IntelliPoint’s Macro Editor, where you can create and string together new macros using the mouse and keyboard, or edit existing macros that you’ve downloaded or created using the macro button. Programming the macros is a fairly intuitive process thanks to the clear design, but there’s a help button that will take you right to the article on editing macros if you get lost. If you’re concerned about draining the mouse’s battery, or want some additional performance from the mouse, you can adjust IntelliPoint’s settings slider in the Wireless tab. IntelliPoint takes a couple of seconds to send the adjustments (higher performance, more battery life, or lower performance, less battery life) to the mouse. Playing around with the settings, I found increasing the performance did not change the feel of the mouse, but decreasing it did; the lowest setting made the Mobile Memory Mouse 8000 feel almost clunky. The default setting of 50 percent seems to work best. If you work with a lot of open windows, you may find the Instant Viewer/Flip 3D functions useful. Both functions allow you to quickly preview and switch between windows; Instant Viewer (Windows XP and Vista) arranges the windows in a grid on your screen so you can choose, while Flip 3D (Windows Vista only) arranges the windows in a 3D cascade you can spin through using the center wheel. There are three areas where Microsoft could improve IntelliPoint’s program settings in the future: first, adding programs to the list requires navigating to the program’s launch file, which will daunt anyone unfamiliar with the layout of the Program Files folder. IntelliPoint should load a list of all of the installed programs first for easy selection, and then give the user the option to find the program file themselves in case something’s missing. Second, while the top level of IntelliPoint highlights each button on a diagram as you mouse-over its name on the list, the program settings dialog box has no diagram and no highlighting. If you get confused about the placement of a button, you’ll need to close out of the program settings and go back to the top level for the diagram. Third, the program seems to be missing two buttons: the left and right tilt of the center wheel. Although officially listed as a five-button mouse, the product documentation notes that you can use the mouse to scroll side-to-side as well as up-and-down, and tilting the scroll wheel does activate horizontal scrolling. However, I’d like to see more customization: I should be able to program those buttons to do other tasks. 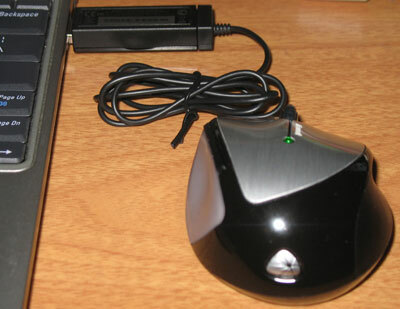 I used the Mobile Memory Mouse 8000 for common office tasks (checking email, writing documents, creating spreadsheets, surfing the Web, etc.) for a week to get a sense of how the mouse performed in day-to-day tasks. Overall, I found the experience very positive, but I did notice one very important thing: it takes a bit (say 20 minutes or so) to really get use to the size of the mouse. 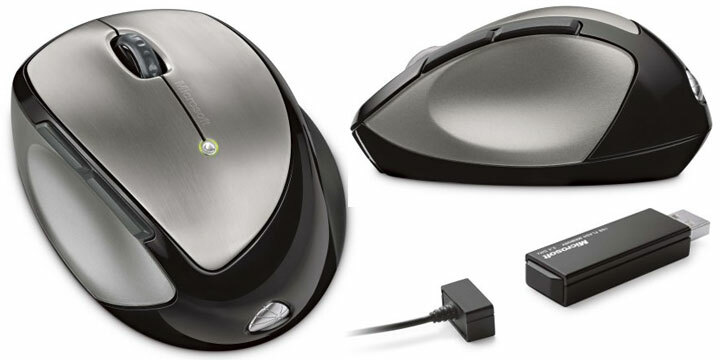 Because the Mobile Memory Mouse 8000 is so small, there’s less movement of the lower palm to control direction, the way you would with a full-size mouse, and for the most part your wrist rests on the desktop surface. Instead, most of the control comes from the fingertips, which takes some getting used to; I also worried that the lowered position would cause wrist strain. However, my sensitive wrists had no problem with the amount of support the mouse offers, and eventually I found the Mobile Memory Mouse 8000 to be more comfortable than the full-sized mouse I normally use for work. The ergonomic design does have one flaw, however: the thumb buttons mounted on the left side of the mouse are just high enough to make reaching them, especially the back one, a bit more of a stretch than seems necessary. Moving both buttons down just a little bit would make them easier to reach. 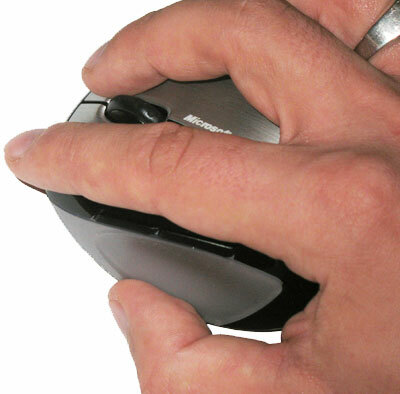 Controlling the Mobile Memory Mouse 8000 is a matter of fingertips, not palms. As I mentioned above, the ‘memory’ part of Mobile Memory Mouse 8000 refers to the wireless receiver, which doubles as a 1GB flash drive. By itself, the drive isn’t particularly impressive; sizes as large as 16GB are readily available at office supply stores, and the flash drive can’t do cool things like run programs. Because of the drive’s dual-purpose nature, however, I’m willing to cut Microsoft a break. The wireless receiver will connect with the mouse from up to 30 feet away. I’m less thrilled about how Microsoft programmed the internal parts of that flash drive, however. One of the most intriguing features of Windows Vista is ReadyBoost, which uses space on flash drives like a faster version of Virtual Memory to supplement system RAM. ReadyBoost is fairly easy to setup – just plug in a flash drive and Windows will ask if you if you’d like to use ReadyBoost with the drive – and according to the program developers, it should work with pretty much any drive. However, ironically enough, the flash drive made by Microsoft seems to be one of the few exceptions, because ReadyBoost will not work with the drive. One of the requirements for a drive to work with ReadyBoost is that it needs to be USB 2.0; since all of the product literature carefully avoids any mention of USB speed, my suspicion is that the Mobile Memory Mouse 8000’s flash drive is actually USB 1.1. To confirm my suspicions, I ran a speed test using SiSoft Sandra’s Removable Storage benchmark, and found that the flash drive is significantly (between 900 and 1000 percent) slower than USB 2.0 drives that are about the same size. The LED on the top of the mouse glows green when charging. 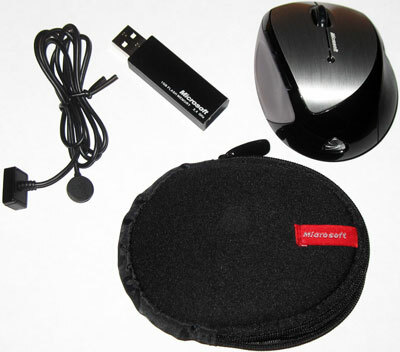 The Mobile Memory Mouse 8000’s comfortable design, smooth response, and wireless connectivity all make it a pleasure to use, while the concept of a wireless receiver that doubles as a flash drive is a very clever use of technology to save space. However, that flash drive seems underpowered when compared to the competition, the placement of the thumb buttons is just a touch too high, and Microsoft is wasting two perfect good buttons by not enabling customization of the left and right tilt wheel in IntelliPoint. On the whole, though, these flaws are secondary annoyances at worst and fixable by software updates at best, and do not keep me from giving my recommendation to this mouse.